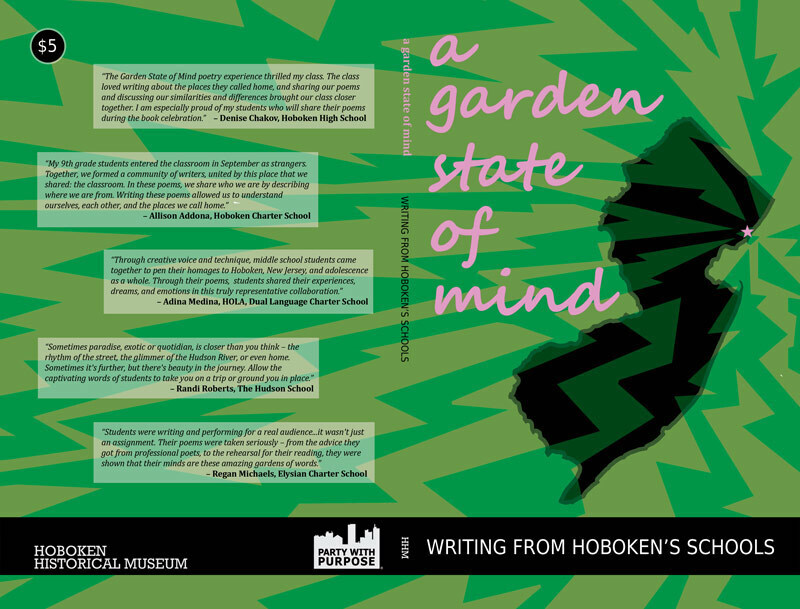 Live reading on May 22, at 3 p.m., at the Hoboken Museum, 1301 Hudson St.
Hoboken, NJ – On Sunday, May 22, there will be a public reading for student participants, teachers, family members, classmates, and poets to celebrate the publication of A Garden State of Mind, an anthology of student writing from five Hoboken schools. The event will be free and open to the public. In November 2015, poets Andy Clausen and Teresa Carson went into five Hoboken schools (Hoboken High School, Elysian School, Hoboken Charter School, HOLA Charter School, The Hudson School) and conducted workshops for about 100 students in the classes of teachers Allison Addona (Hoboken Charter), Regan Michaels (Elysian), Randi Roberts (The Hudson School), Denise Chakov (Hoboken High), and Adina Medina HOLA). Selected students then participated in an after-school Master Class in February 2016 at the Hoboken Historical Museum, led by Clausen, Carson and Hoboken Historical Museum’s Poet in Residence, Danny Shot. On May 22, the poetry anthology A Garden State of Mind will be distributed as the culmination of the project. Copies of the book will be given free to participants and offered for sale to the public for $5. This project was made possible by a generous grant from Party With Purpose.